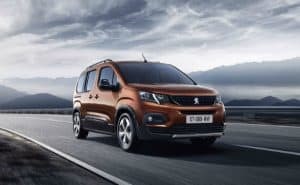 Peugeot has released the first pictures and details of its newest people carrier – the Rifter – which will go on sale this summer. The Rifter is considered to be the spiritual successor to the Partner Tepee and reworks the finer elements of that model, before updating its look and feel with a sleek design and more refined driving experience, in a bid to shake-up the segment. Buyers will be able to choose from a five-seat model or – from next year – a seven-seater version, as well as two vehicle lengths: standard (4.4 metres) and long (4.75 metres). Every Rifter will come with two sliding side doors, opening rear tailgate window, three individual-folding rear seats with ‘magic flat’ function and a ‘Zénith’ roof with numerous storage spaces. Engine options will include the award-winning 1.2-litre PureTech 110 S&S petrol engine, linked to a six-speed manual gearbox, as well as the 1.5-litre BlueHDi 130 S&S with a six-speed manual or eight-speed automatic gearbox. Styling quirks witnessed with Peugeot’s successful SUVs – such as a short, horizontal bonnet – have been adopted, resulting in a unique silhouette for the Rifter. Inside will be Peugeot’s intuitive i-Cockpit design. This means it has a compact steering wheel for better grip and improved handling, an eight-inch colour touchscreen angled towards the driver and a raised instrument panel, enhanced with chrome-plated surrounds and red needles. A turning radius of 10.9 metres unlocks more agility and a richer driving experience than many would expect from a vehicle like the Rifter – something that is helped by the fact the model is built on Peugeot’s modular EMP2 platform. Professional rally driver Stéphane Peterhansel has already spent some time behind the wheel of the Rifter and his comments suggest positive things. “Its dynamic capabilities, precise driving experience and agility impressed me. I can tell you that it was designed to support me in all circumstances,” he commented. The Rifter will be open for orders from early summer, following its world premiere at March’s Geneva Motor Show.